Zlatan Ibrahimovic has revealed that he agreed a switch to LA Galaxy before joining Manchester United, only for the move to collapse. 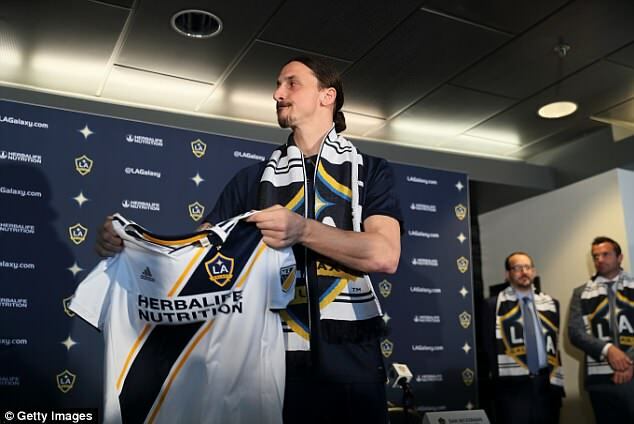 Ibrahimovic was unveiled by Galaxy in California on Friday after the Swedish striker agreed an 18-month deal with the MLS club last week, following United’s decision to terminate the remainder of his contract at Old Trafford. Galaxy had been tracking the Swedish striker for several years before finally getting their man, after initially opening talks when he was still at Paris Saint-Germain. Ibrahimovic was equally keen to join Galaxy at the end of his PSG tenure in the summer of 2016, but the proposed switch fell through and he ended up penning a one-year deal at United. ‘It was supposed to happen before Manchester United. My head was here. I wanted to come here and it didn’t happen,’ said Ibrahimovic. Ibrahimovic made just seven appearances for United this season after returning to the fold sooner-than expected in November, following his recovery from torn knee ligaments sustained in the Europa League semi-final against Anderlecht last April. The 36-year-old didn’t feature for Jose Mourinho’s side after December and admits he was struggling to return to full fitness. He said: ‘When I came back to the team in Manchester, I started to play, but I had a bit to do before I could go all in. ‘I played six to seven games, scored a goal, but I felt something. I didn’t feel 100 per cent. I didn’t feel ready, so I took a step back. ‘I wasn’t there because I’m Ibrahimovic, I’m there for results and if I couldn’t do it, then someone else needed to go on the field. I like to do something where I can give back and that’s with results. 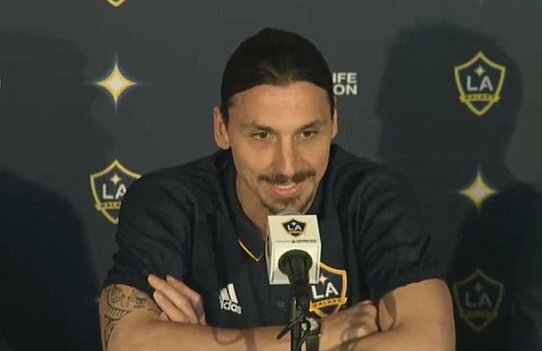 Despite his injury troubles, Ibrahimovic has declared himself fit for Saturday’s inaugural Los Angeles derby against MLS new boys LAFC after training with his new team-mates for the first time on Friday morning. ‘I’m available. I have so much adrenaline in me, so I think I can last a long time,’ he said. ‘We start step-by-step. I’m not here for one game, I’m here for the season. I think the coach wants to build it up and make me feel comfortable, settle in. Ibrahimovic’s advancing years and the condition of his knee has prompted plenty of question marks over whether he can be a success in MLS. But he brushed aside those concerns with typical bullishness. ‘I’m like Benjamin Button!’ said Ibrahimovic. ‘They said I was too old in the Premier League – the fastest competition in the world. ‘But I did it and took over. After three months, the super-haters – all the people who were criticising – became my fans. I will always take the hardest challenge that is out there. ‘At 35, people said I would never make it in the Premier League, even players I talked to. ‘I had 20 years of experience in other competitions and had won trophies, but they said I would be gambling that if I went to the Premier League and the one season wasn’t good. ‘But I took all those years and put it on one bet to go to the Premier League and see what happened. ‘Same thing here, I don’t have anything to prove. I just have to perform. I know what I’m able to do and I will do it. I know in my head what the game is. Now the rest of my body has to follow. However, Ibrahimovic was more evasive over whether a return to fitness and form at Galaxy could see him come out of international retirement and represent Sweden at this summer’s World Cup. He added: ‘Let me first enjoy it here. What happens here will take it further. My focus is on Galaxy, to be available, help the coach, club, whatever they need.